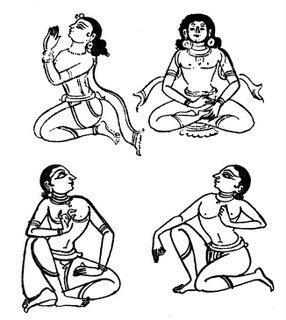 This segment is in the nature of a supplement to The Art of Painting in Ancient India – Chitrasutra (3) . I mentioned therein: “The Chitrasutra explores in great depth the characteristics of persons hailing from various regions and occupations. Since it is rather too detailed, I would be posting a summary of that, along with few other issues, in a separate article”. Hence, this post. The Chitrasutra, at several places, discusses the appearances of persons and objects that we meet/see in our day to day life. It instructs, the representations of the objects and persons, as drawn on the canvas should bear a credible resemblance to their original. The text, therefore, reckons rupa-bheda and sadrushya, among the six essential elements of a painting. Rupa-bheda consists in the knowledge of special characteristics of things – natural or manmade; say, the differences in appearances among many types of men, women or natural objects or other subjects of the painting; while Sadrushya aims to depict, in painting, those distinctions and resemblances. Shiulparatna, another ancient text, too refers to painting as that which bears resemblance to, and looks like a reflection in mirror. The Chitrasutra instructs that the resemblances should not merely be in general but should extend to details as well. Every part of the object represented should agree with the general treatment of the whole object. It also says that the persons should be painted according to their country; their region, their colour, dress, and general appearances as observed. Having well ascertained the person’s country, region, occupation, age and his status in life; the text says , his other details such as his seat, bed, costume, conveyance, stance, and his gestures should be drawn. The Chitrasutra explores this subject in great depth, detailing the characteristics of persons hailing from various regions and occupations; the nobility, widows, courtesans, artisans, wrestlers, soldiers etc. It presents a virtual catalogue. I am posting some of them, in a summarized form along with some illustrations (wherever available) from the sketches of the figures depicted in paintings of Gupta period. Such men and women as are devoted to religious practices; and kings , gods as also beings such as Yakshas, Gandharvas, Nagas and Rakshasas ; the maids in the queen’s quarters (Kanchuki), tradesmen, ministers and priests should be dressed in white robes with, of course, each with their distinctive styles, qualities and richness , depending upon their nature and station in life. In the case of the Nagarikas, their garments should be of fine texture. The garments of the damsels should be sprinkled with perfumes like musk (Kasturi), saffron (kumkuma) etc; and, cosmetics like laksha, alaktika, gorochana and chandana. The rouges, the Vita and the vicious ones, intoxicated, should be in dark, gaudy costumes. Those playing the roles of ascetics, monks and nuns should wear robes in vermilion or yellow or any other colour in keeping with each ones tradition. As regards the hermits and their celibate disciples, they should be decked in garments made of the bark of the birch tree. The warriors and soldiers of various class and ranks should be attired in the appropriate military uniforms and turbans, sporting various medals, arms. The Commander-in-chief s should be adorned with coronets and crests. Gods, divine beings and kings should be presented with crowns, diadems decorated with gems and other precious stones. The handsome looking King wears a brown striped silk garment. He is offering flowers to the gods , placed on a tray painted with designs. He wears a tiara of floral motif from which hand string of pearls and sapphire. He has on his wrists bracelets of different kinds. The tender looking Prince wears a classy, decorative crown, twisted like turban in stripes; and, bound, at intervals, with braid. The crown is studded with large gems and is encrusted with brooches at the sides; and, has a central ornament on the top. He wears a simple earrings (Kuntala) ; a single string of pearls (Muktavali). His flowing hair comes down to his shoulders; is loosely knotted at the nape; and, bound at the back with ribbons. On his young forehead, play the stylized curls. Women of good-families should be made bashful, wearing ornaments and not showy dress. The beautiful looking queen seated on a decorated chair is dressed in antariya, a sort of lehenga tied to body at her waist. She has an uttariya (duppatta) the upper garment made of fine material. She is adorned with several pearl neck-laces (mukthavali), ornamental pearl -bracelets on wrists (valaya), on upper arm (keyura).She wear rings (angulya) on her fingers, and anklets (nupura) round her ankles. Her hairstyle is elaborate and made into a bun at the nape. Her hair is adorned with flowers, jewels and a tiara. [Note: BTW, the bodice or blouse is a late entry into the Indian notion of dress. The aristocracy, the ladies of position, and queens of vey ancient India did not usually use a bodice or blouse (as you can see from ancient fresco at Ajanta etc). The women in orthodox families, engaged in religious duties too did not use one such. But , somehow the chambermaids , the female attendants on the king and the queen, were required to wear a bodice – Kanchuka , a long narrow scarf, which did not require much tailoring. The chambermaids were therefore, generally, designated Kanchuki (कंचुकी) – as in the old Sanskrit dramas of 2nd century BCE. The Buddhist nuns were, usually, allowed to use three pieces of cloth: samghati (for lower part), antarvasaka (for the upper part) and uttarasanga (covering garment, in cold season). Kanchuka or bodice was allowed to young nuns. Some say that wearing a blouse or jacket came into vogue after the entry of Scythians, Kushanas and such others who hailed from cold regions. And, it became fashionable during the Muslim period. The northern influences took some time to percolate down to the orthodox Deep South. While her upper body is left uncovered, she wears a skirt (Ghagri ) stretching up to the knees ; there is a draw-string (nada) at the waist ; the border of the woven silk material is vertically down the center. Her hair is parted at the center , with chignon on nape decorated with ribbons; a wreath of leaves is worn around the head. The queen had several maids, and each had her function. Their dresses, styles and ornaments too varied accordingly. She is a rather stern looking lady with her hair neatly done and decorated with a tiara (makuta).She has wheel-like large ear–rings (kundala), a strand of pearls across her neck (haravsti) and a twisted wire necklace. She carries a fly-whisk (chauri). She wears a short lower garment tucked in under her belt (mekhala) and perhaps a choli too. She is modestly adorned with a strand of pearls round her neck (haravsti), an armlet (keyura) and a bracelet (valaya).She has simple ear-rings. Her hair is drawn back into one plait with few curls on her fore head. 7. Another maid is dressed in a lehnga –type , of striped cloth(Anatriya); and, choli-type blouse (Cholaka) with an apron front and V-neck made of pulakabandha-tie and dye cloth. On her ears, she has rings (Kundala); and, wears simple bangles (Valaya). 8. This maid appears to be from the West. For dress, she wears a double jacket (Cholaka), of bandhni (tie-dye cloth) the upper one with shorter sleeves in the angarkha style; the lower one with longer sleeves. The angarkha is shown open;, the left edge of the neckline fastening is curved to fit the inside right edge probably with ties . 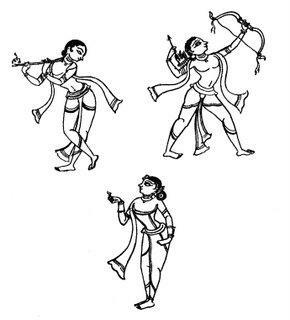 9.Another maid servant has a simple skirt with a draw-string (nada) and a breast-band (prathidhi). She has an armlet (valaya) , large ear-rings (kndala) . Her hair is worn loose and long. She carries a palm-leaf fan. 10. There was an Ayah (nanny) type of maid too. She wore a long sleeved tunic and covered her head. She had large ear-ring (kundala) and a simple chain (hara). 11.This Nanny was, perhaps, from the North-West region. She is dressed in a tunic (Angarkha) reaching up to her knees; with long sleeves; and, bordered all around the edges. She wears a heavily gathered skirt (Ghagri) tied at the hips with a nada. Her head is covered with a scarf –like long cloth (Uttariya) having a decorative border; and hanging behind the shoulders. As regards her hair; it is shaped into a thick twisted roll, with a padding fixed at the center parting and held in place by tiny plaits of hair. Her head is covered the head with the veil , which is possibly of Parthian /Scythian origin ,and is seldom seen at Ajanta. The dancer who entertains the queen has an apron-front dress with long sleeves. Her lehanga (antariya) is short with patterned stripes. She perhaps has a choli too. She is well decorated with strands of pearls (muthavali), bangles and brace-lets (valaya), elaborate ear-rings (kanchana kundala) and a tiara (makuta). For hair-style, she wears a large bun on her nape; she is adorned with flowers, several strands of pearls and chains, held in position by broaches. 13. Another dancer is clad in a sari-like garment and a full sleeved upper garment. She has a simple twisted sash round her waist. She is adorned with a necklace (hara),a row of bangles (valaya)on her left wrist, ear rings (kundala)and a set of heavy rings(nupura) round her ankles. Her hair style is a chaplet of leaves. Widows are to be shown with grey hair, wearing white clothes. She wears a sari –like garment fully covering. Her ornaments are modest; with a string around her neck, simple brace-let and ear-rings. Her gray hair is drawn back in a knot. The female security guard in queen’s quarters was well covered with a knee-length tunic having long sleeves. Below that she wore another garment reaching up to her ankles. Her hair was drawn back tightly. She wore a simple neck-lace (hara) bracelet (valaya) and a heavy –twisted sash round her waist. She wore heavy anklets (nupura). She carried along sphere and an embossed shield.. She appeared to be a mixture of indigenous and foreign styles. Musicians, dancers and those in their party entertaining the royal couple should wear gorgeous dresses. The dancer, usually, has a long garment from his waist down to ankles. He is heavily ornamented with rows of neck-laces and jewellery around his arms, wrists and around the waist. He has an ornamented head gear too. Heralds should be drawn tawny and squint-eyed, carrying staffs in their hands. A Herald is often shown in calf-length tunic with pointed ends; and with trousers narrow and clinging to legs. He also had a sash round his waist. He is not shown with jewellery; but holds a staff. He has an ankle length tunic and a long sleeved upper garment. A round cap with border and a plume sits on his head . Bards should have a resplendent dress. Their look should be directed upward and the veins on their neck should be shown. Door-keepers should be shown with a sword hanging by his side. He holds a staff in his hand; he should not look mild. His dress should not be too conspicuous. He has a coat made in kachcha (Gujarat) style; and turban with twisted clothing. He holds in his hands a sphere and a shield. There is perhaps a sword hanging by hid waist-band. Sages, emaciated yet full of splendor should be represented with long stresses of hair clustered on top of their head, with a black antelope –skin as upper garment. He wears a simple tunic-like garment (Kancuka) with a round neck and long sleeves. It is open at the front. On top of that tunic, he is wrapped with a long garment (Uttariya) coming around his waist , and thrown over his left shoulder like a upavita ; with the final end resting on his left arm. He does not wear many ornaments, except for an earring (Bali), with a pearl suspended. Round his neck, he wears a simple necklace (Haravsti) of large pearls . His long hair is combed back , smoothly. Priests should be represented with white garments, and emitting splendor. A priest was shown wearing a dothi type of garment and an upper garment (uttariya) thrown across his left shoulder. He had a simple string round his neck. His hair was tied in a top-knot. She perhaps was a counterpart of the priest. She wears an elaborate tiara-like ornament around the head (Ratnajali); and, there is a central ornament at the forehead from which are suspended the strands of pearls. She is decorated with garland (Mala) of flowers. And, large flower rests on top of one of her ears like an ornament (karnavathamsa).And, on the ears she wears a large-sized ring (Kundala). Further, higher up on her ears are suspended small earrings of pearls (Bali). On her chest she wears a string of pure pearls (Suddha Ekavali), with a gem hanging from its centre. Her hair is worn in a large pompadour style on the crown of the head with tiny curls neatly arranged along the forehead. And, strands of pearls form a net over the hair-style. She carries an offering. She wears two long strings of pearls crossed at the chest (Vaikaksha); and , a string of pearls (Muktavali ) round her neck. On her ears , she has large disc-type earrings (Kundala). On her upper arms , she wears armbands (Keyura); and, bracelet, one on each wrist (Valaya). One her legs, she has anklets (Nupura). As regards her dress, she wears a short blouse (Choli); and, over that, an upper garment (Uttariya) worn over the left shoulder. She is dressed in a striped drawer- a short strip of cloth worn around the waist with an attached strip from the centre of the waist which is drawn up between the legs and tucked in at the back. For the head, she has a striped scarf tied around the head and knotted at the back, tassels are visible behind the right shoulder; further back on the head is a decoration of leaves with a central motif probably tied around a chignon-type hairstyle. The commander of an army should be represented as strong , proud and tall, with big head, powerful chest; fleshy shoulders , hand and neck; firm hips,; prominent nose , broad chin with eyes raised upward towards sky. Soldiers should generally be painted with frowns on their faces. Foot soldiers should be represented with short and showy uniforms, carrying weapons. They should have arrogant looks. A foot-soldier wore a short jacket (cholaka) with half-sleeves, covering the chest. The lower garment (antariya) was short above the knee –level and had decorative stripes. He wore long hair and no headgear. He often wore domed caps with bands. He carried a sphere and a shield. Another soldier carrying a sword and shield is dressed in a calf-length tunic and a girdle at the waist. 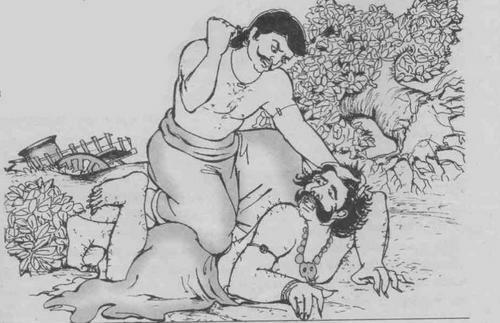 He has a disc type ear-ring (kundala). His hair is drawn in large top-knot bun. Good archers are to be shown with bear legs. Their dress should not be very short and they should wear shoes. He has a tunic with short sleeves and up to the mid-thigh. He has a wide wrap round his waist (kavabandh); an elaborate turban with top-knot; and, has earrings. Elephant raiders should have swarthy complexion. Their hair should be tied in a knot. They should wear ornaments as well. It is said the foot soldiers and elephant-riders in the Gupta army wore a similar uniform. They wore sometimes more resplendent in gold-striped antariya and skull caps or fillets on their heads. Horsemen were shown dressed in coat having pointed collar and floating ribbon ties; baggy trousers up to ankles and wearing dome-cap. Wrestlers should be drawn with broad shoulders, fleshy neck and lips; with closely cropped hair; and with arrogant and impetuous looks. The elders and respected people of town and country -side should be painted looking calm, with almost grey hair, adorned with ornaments suitable to their status, wearing white garments; and stooping slightly forward, ready to help. An elderly gentleman’s hair is arranged in a large top-knot and with turban in a twisted style. He is decorated with elaborate ear-rings , necklaces and bracelets. Merchants should be shown with their heads covered on all sides by turban. A merchant is usually shown in a calf-length tunic (kanchuka) gathered at the neck, with long sleeves. He has a heavy looking and a long cloth (uttariya) thrown across his chest and shoulders. He has waist band too (kavabandh).His turban has a fan shaped frill. He carries a baton like stick. He wears a long lower-garment (Antaravasa) , folded into layers around the body. At the waist the garment is was secured by a girdle or tucked into the nada (drawstring). 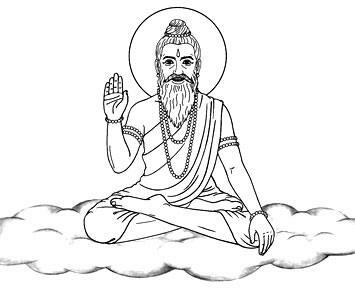 He has the upper garments (Uttarasanga) thrown over the shoulder in a loop. He is clean shaven’; and is usually shown carrying a bowl. The following is also by way of an appendix. This is about the details provided in Chitrasutra for preparing the wall-surface for the purpose of painting a mural. A word of caution ; the instructions detailed here are rather too technical me. And , I do not pretend I understand all that is said in the text . That is the reason, I am posting those details in the form of an appendix. A. The wall has to receive a thick coating of bricks , burnt conches and the like , powdered and mixed with sand; the watery preparation of molasses and drops of the decantation of mudga(phaseolus munga –mung pulse) amounting to a fourth part of the mortar powder. In to that, smashed ripe banana fruits have to be added, also a fourth part of the amount of the mortar. After three months, when the mixture is dried, it shall be ground again. Then it must be mixed once more with molasses-water, until it gets a touch of fresh butter. In this stage, buffalo-hide has to to be boiled in water, until it becomes soft like butter. The water then has to evaporate and sticks have to be made of the paste and dried in the sunshine. This hard plaster is called Vajra-lepa (diamond like –paste). If, then boiled in mud vessel with water, it will make any colour fast with which it is mixed. If mixed with white mud, it has to be used as coating for the wall, in three layers, each layer being allowed to dry before the application of the next. The wall having been cleansed with coconut fibres and having been sprinkled for some time with molasses- water, on this the painting may be applied. This is the two-fold process by which the wall is made ready for the drawing and application of colours. B. Brick powder of three kinds has to be mixed with clay, one third part (in amount of the brick powder). Having mixed saffron with oil, one should mix it with gum resin, bees’ wax, liquorices, molasses and mudga preparation in equal parts. One-third part of burnt yellow-inyrobalan should be added therein. Finally , the astringent made of Bel-tree (Feronica-elephantum) destructive (of all injurious agents) mixed in proportion of two to one should be added and also a portion of sand , proportionate to the amount of the whole. Then the artist should drench the mixture with moist split pulse dissolved in water. The whole of the moist preparation has to be kept in a safe place for one month. After the moisture has evaporated within a month, one should put this dried, yet still damp, plaster on the wall, having carefully considered everything. It should be plain, even, well distributed, without ridges or holes, neither too thick nor too thin. Should it look ill-done after having become quite dry , due to shrinkage , then it ought to be carefully smoothened by coatings of plaster made of that clay (as mentioned before) mixed with resin of the sala-tree (shorea-robnsta) and with oil. It is further made smooth by repeated anointing, constant sprinkling with water and by careful polish. When this wall has promptly dried, it does not go to ruins anywhere even at the end of hundred years. By this same means various jeweled floors can be made of variegated mixture in two-fold colors. For the preparation of paint ground this text prescribes three types of brick dust and three parts of mud mortar to which Guggula (gum or resin), madhu-cchlliioa (bee wax) are added in equal quantity. According to the text all these must be mixed with one third of powdered burnt lime, pulp from bilva (Aegle marmelos) in two to one ratio along with necessary quantity of salt free sand. The text recommends storing this mixture in water mixed with the bark of picchila (a legume, probably Dalbergia sisoo, Bombax heptaphyllum) for one month. An experienced artist removes this mixture from the container and applies it to the wall and allows drying. Particular care has to be observed that this layer is smooth and uniform and neither too thin nor too thick. If the wall that is starting to dry does appear not properly done, then it must be carefully polished to make it uniform with a layer of intonacco (lepna) made up of earth mixed with a juice of oarja (Shorea robusta). The surface is also polished with a fine lamp black (anjana) and repeatedly spread with milk. The text confirms that the wall mortar treated in this way will not deteriorate even after one hundred years. It also says that the same procedures must be followed to prepare various paint grounds. For the binder, the Vishnudharmottara prescribes the use of decoction of skins (Carmakvatha) which corresponds to famous Vajralepa glue, used in the mixture to cover the surface that act as protective coat. The text provides five different recipes for the preparation of Vajralepa. One of the recipes lists ox or buffalo horns among the ingredients, a buffalo or cow or goat skin mixed with juice of bimbo (Momordica monadelpha) and kapittha (Feronia elephantum). In Vishnudharmottara the use of binders with vegetable origin is also prescribed. One such recipe is the juice of bakula (Minusops elengi) and sindura (Grislea tomentosa) which are mixed with Carmakvatha. For protective agent or fixative, the text recommends application of juice of Cynodon dactylon (durva grass) to the finished paintings with the help of cloth soaked in it. The Samaragao Sutradhara describes very clearly to Vishnudharmottara between the first preparatory layer known as bhumi-bandhana and intonaco, known as Lepkarma. It recommends that juice from various plants, such as Snuhivastuka (Euphoria anti quorum), kuimaoa (a cucurbit, Beninacasa cerifera), kuddali (Bouhina variegata), Opamarga (Achyrantes aspera) and Ikika (Sugarcane sp.) are let to rest for a week and them mixed with the juice of Siaoapa (Dalbergia sisso), Ashoka tree, Nimba (Azadirachta Indica), Triphala (Myrobalan sp. ), kuooja (Wrightia antidysenterica) and kaiayaka (Acacia catechu) together with sea salts (about 2%). This mixture is sprayed in previously leveled wall where the painting work has to be undertaken. The juices of these plants are used to wash the wall surface that also probably works as insecticides. Some of the fine earth is mixed with double quantity of sand, to which juice of kakubha (Terminlia arjuna), Maia (seeds of beans or other legumes), oalmali (Salmalia malabarica) and oriphala (Aegle marmelos, bilva or bel tree) in variable proportions are added. The mortar thus prepared by mixing the ingredients are applied to the wall in sufficient quantity to get what has been described as thickness of elephant skin. When the wall is dry it must be washed with care. Whitish lime stone fine powder is mixed with boiled rice and starch in correct proportions and applied three times to the prepared wall. After the application of first preparatory layer (bhumi-bandhana), neutral colored, red or brown clay collected from different places (such as bank of lotus pond, side of the wall under the roof of tree or along the bank of the river etc.) is applied on the wall. For the third layer, the text says that earth from anthill (free from stone grains) should be added to the juice of Oalmali (Salmalia malabarica), kakubha (Ferninalia arjuna), triphala (myrobalan), chopped betel nuts (Areca catechu, kramukha), bilva pulp (Aegle marmelos, bel tree), horse hair, ox hair, coconut fiber, a certain quantity of rice husk, and double quantity of mud and sand in one to two ratio in respect to mud is applied on the already prepared wall. A further mixture of mud slip and marble dust, gypsum or sugar dust is applied to the mortared ground with a brush. Finally, the mixture of lime putty and wax is applied. Silpratna is the southern Indian traditions of preparing paint ground with lime based materials. The text prescribes that the mixture of first layer is prepared with lime obtained from conch-shells burnt in wood fire and grounded into powder, mixed with a quarter part of mudga juice (Phaseolus mungo), a quarter parts of sand and molasses and a quarter part of paste of banana burnt in fire. After proper mixing, these are stored for three months, after which it is grounded in the form of a mortar with molasses until it has the consistency of fresh butter. In the meantime, the wall is first leveled and polished with coconut coir brush. It is then tampered with molasses water to keep it wet for at least a day. The lime mortar prepared as above slowly applied layer by layer to the wall so that the surface becomes smooth and uniform. While intanaco application is under progress water must be sprayed on to the surface using coconut coir brush. For the preparation of upper preparatory layer, powdered shells or white earth fine powder mixed with kapittha (Feronia elephantum) and nimba (Azardirachta Indica) is applied to the wall. This compound must be applied using the bark of ookooa (Trophis aspera) tree or with a brush made up with the stem of ketaki plant (Pundunus odoratissimus) plant until the wall becomes smooth and polished. The same powdered lime having been moistened with the milk of a tender coconut is again grounded and diluted with hot water and applied again to the intonaco as described above. Analysis of mud mortars and its composition reveals that there are no changes either in composition or technology of preparation of mud mortar and execution technique of murals at Ajanta supporting the short chronology. The investigation showed that the organic binder has invariably been used in the preparation of mud mortar of Ajanta in accordance with ancient text which might have now transformed into calcium oxalate, observed through FTIR images. The mortar is also found mixed with organic additives such as rice husk, plant fibers and seeds for re-enforcement. With minor variations, almost similar technology was used for the preparation of mud mortar and pigment layers were also found mixed with organic binder and sometimes with kaolin as per ancient text. With minor modification, the technique of painting at Ajanta remained almost identical and the pigments used are always natural mineral colors. All the pigments are of local origin except lapis lazuli which was probably imported from Persian countries through trade on silk route. The studies are of great importance in planning future conservation measures of Ajanta murals and understanding of execution technique. Please do read the other articles too , in the series. dealing murals of ancient and medieval India . please read those. thank you for reading this. the chitrasutra presents a virtual catalogue; and it could not be fit in the article (five). i posted some of those an annexure. it was an after-thought. i reckoned not many might read these rather uninteresting details .now, you read it and liked it; i am delighted. the main text is from chitrasutra. the illustrations are line-drawings based on the ajanta paintings, in most cases. this is my first visit to your blog through your comment in mine. i dont kno how i missed this fantastic blog all these days. How shall i contact youto get some information about our gifted artist Thippaji chitragar. 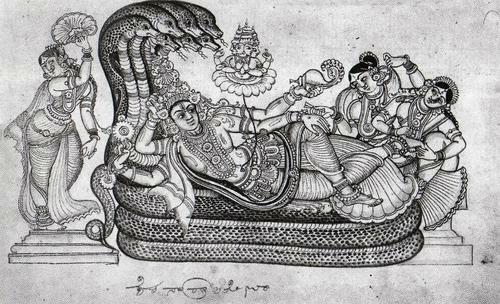 It is a well compiled work giving some details of the life and work of Sri Thippajappa , containing reproduction of about 74 of his line drawings . Though his time is indicated as 1780-1856, Sri K Jnaneshwar (said to be a descendant of Sri Thippajappa) who is the co-author of the book says that Sri Thippajappa might have been born in 1830. Where shall I get the book “Traditional paintings of Karnataka” published by chitrakala parishath..?